Happy Wednesday! I have to admit, this week has been crawling! It could be due to the fact that I'm leaving for Iceland a week from today... I'm so excited but so confused as to what to pack. This Sunday will be dedicated to packing (and making sure my luggage doesn't exceed the strict weight limits!). This Spring pant look was like a little tease for me... Luckily, the weather is finally starting to warm up around here, combined with longer amounts of daylight, soon Spring will have sprung. However, the weather in Iceland will not be so lucky. I anticipate a multitude of weather conditions: wind, snow, rain... which leads to my biggest packing conundrum: foot ware. My hunter boots are a no-brainer, but I'm still weighing out my other foot ware options. Stay tuned for more on my trip... Thanks for reading! 12 comments on "the Perfect Spring Pant"
I'm having major envy over those chic flowered pants, and I love how you paired them with the tie blouse and neutral pumps. So elegant! Perfect spring pants indeed! Love it with the blush top! Those pants are so fun! Love how you styled them! Oh Kristy, so lucky that you will go to Iceland but yes it is freezing cold there. These are the perfect Spring pants. The floral is so pretty and I am a sucker for a pretty bow-tie blouse. I think I need a blush one like yours. Your quilted black jacket is my favorite piece here though. Stunning head to toe. 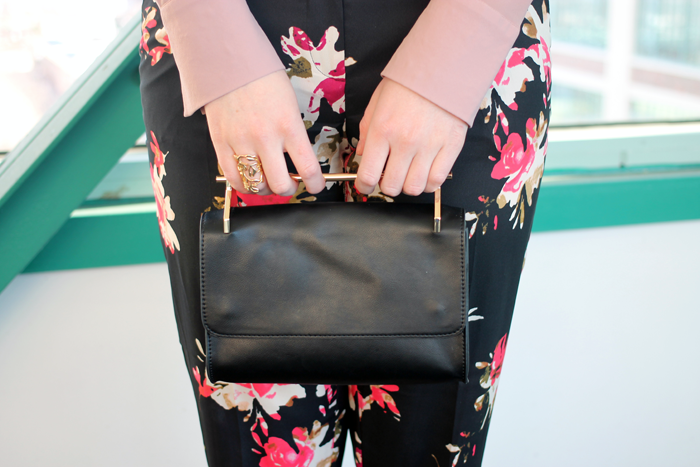 I am also wearing Spring floral pants in my latest post. Great minds think alike! Welcome by my blog. Also, I run a linkup on Thursdays. This week’s current, brand-new linkup is live (a day early). I would love for you to join it. Thank you.